So.. just in case you weren’t able to find anything that got your blood running this last weekend on QVC, BE doesn’t want you to feel left out.. this Friday there will be another 12 hr. sale. Just came across this today for those who have an ULTA nearby. 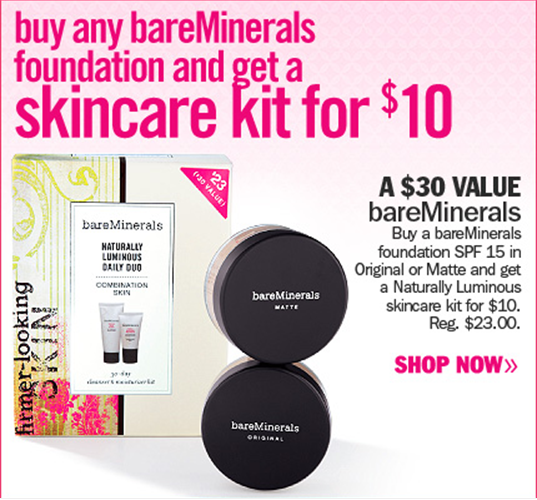 Buy any Bare Minerals Foundation and get a skincare kit for 10.00. What a fab way to replenish your Foundation (If you didn’t get the TSV with the lifetime supply) AND try the Skincare if you haven’t. 🙂 Also, if you’re shopping online, don’t forget Ebates! If you’re not using Ebates, you’re wasting $$. Right now Sephora.com is offering 8% back on all purchases and QVC is also among the retailers you can save through. This is a great time to sign up if you haven’t already. I just did all my online Back-to-School shopping for my girls AND saved money at the same time.. gotta love that! But yeah, here’s a link: Ebates.. gotta love ’em! … come Christmas time, I looooooove Ebates. Seriously, if you do any online shopping, you need to sign up. Get a FREE Blissful Pearl and Magnificent Pearl eyecolor and a full-sized Big and Bright Eyeliner in Granite (a 40.00 value) with any purchase of 60.00 or more. Offer ends August 28th. Use code: AUGUST at checkout. Boutiques will offer a Creme de la Creme and Magnifique eyecolor with a Big and Bright Eyeliner in Black Coffee. All 4 eyecolors were previously only available in QVC AD’s and are limited edition with this promotion. BE’s having another online 12-hr. sale! This Friday, July 22nd, starting at 9am. Here’s the link: July 12-hr. sale. Join me on FB for all the latest breaking BE news.